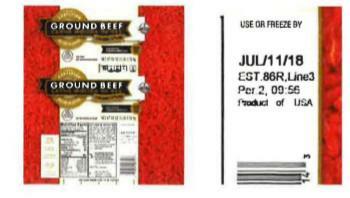 Cargill Meat Solutions of Fort Morgan, Colo., is recalling approximately 132,606 pounds of ground beef. The products, made from the chuck portion of the carcass, may be contaminated with Escherichia coli O26. An epidemiological investigation conducted by the U.S. Department of Agriculture’s Food Safety and Inspection Service, Centers for Disease Control and Prevention, and state public health and agriculture partners have identified 17 illnesses and one death with illness onset dates ranging from July 5 – 25, 2018. The recalled products, bearing establishment number “EST. 86R” inside the USDA mark of inspection, were shipped to retail locations nationwide. Consumers with questions regarding the recall may call (844) 419-1574.